Microsoft released the “Update Rollup 1 for System Center Configuration Manager current branch, version 1606” a few hours ago, which list the below issue as fixed in the release notes. The Update Rollup 1 is available for installation in the “Updates & Servicing” Node, in the Administration Workspace of your 1606 Site. A few days ago, I noticed that the Backup of my ConfigMgr 1606 Environment is getting bigger everyday. Normally this doesn’t really bother me, but the amount of Disk Space that the Backup started to consume made me take a closer look. After looking at the Backup Files, I noticed, that the inboxes Folder is around 2.5 GB in size, which is definitely not normal. While breaking this further down, I saw that the epmgr.box contains about 100 EPP Files, which are each around 25MB in size. According the Modify Date, those files are getting created after each Sync of the Software Update Point and are containing some Endpoint Protection Meta Data. Based on information that I got in the TechNet Forums, there is a Hotfix coming, which will fix this Issue. Until then, those files can be manually deleted. A big thanks to Torsten Meringer, for initally confirming the Issue in the forums. In the meanwhile the Product Group publically confirmed the issue. 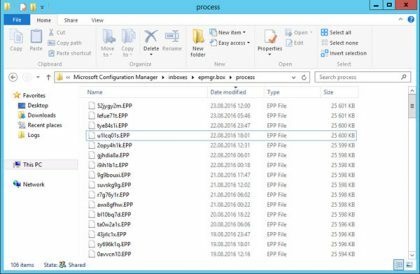 What about this issue on SCCM 2012 Sp1 CU3 ? Has anyone ever seen it ?